Well, we've seen dirks and many other forms of dagger, so let's see your Skean-Dhus. Here's mine. It's marked J. Nowill & Sons Sheffield. The glass "jewel" fell out while marching in a parade, so I've replaced it with a smokey quartz nugget. I also have a sgian achles. Does that count? How do you like Nowill's version, as a knife? Here is a quickly made picture of mine, made by Carel Smith (South Africa) Handle made of carved ebony, fittings of sterling silver and ostrich leather covering the sheath. As you know probably the most common spelling is Sgian Dubh and it is pronounced "skeen du". Here is a not too good photo of my favorite sgians. The top knife is a J N Wills and Sons Ltd "Skean-Dhu". The "S" in Sons is missing. William, this is the same blade you have with your sgian. I have had this sgian for over 20 years and use it regularly. The handle looks like red deer antler and the trim is nickle silver. The bottom knife is from Comrie Crafts of Pitlochry Scotland. The stainless steel blade is fitted with a European roe deer antler handle with ebony trim. Jim Young, proprietor of CC makes the handles and fits them to factory blades. He offers a wide variety of exotic hardwoods and red deer antler with interesting trim like 6,000 year old bog oak. I really like mine and only wear it when there is limited danger of damaging or losing it. Although the back of the handle has been smoothed off the small tines can still get a bit uncomfortable toward the end of the day. But, it is worth it to be able to carry such a nice sgian. 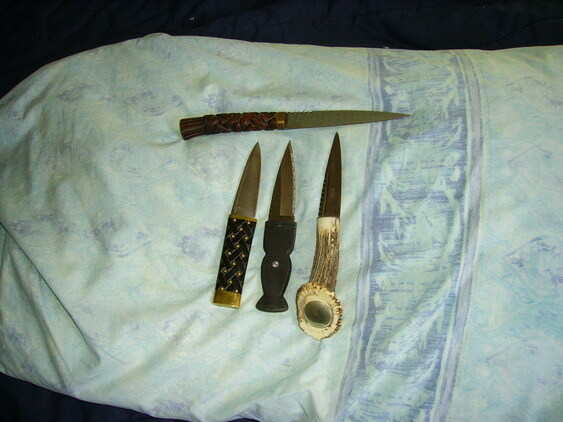 Here are some sgian dubhs that I have accumulated over the years. 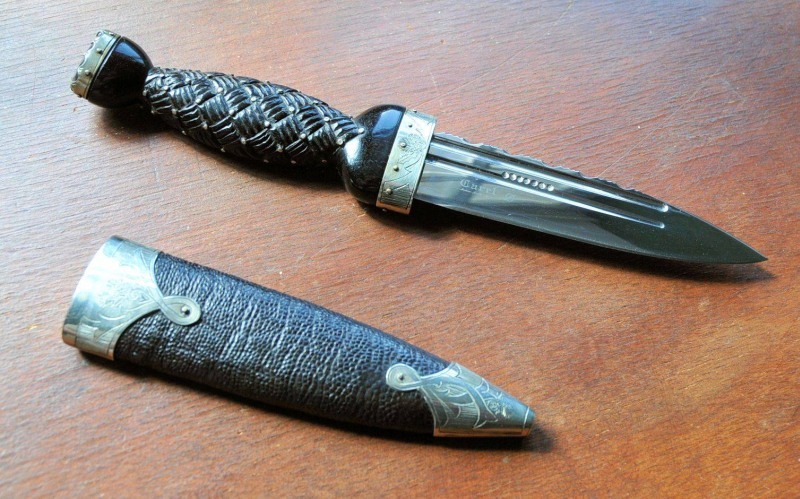 The stag-hilted daywear sgian dubh at the top is a J. Nowell knife with a custom leather and silver sheath. 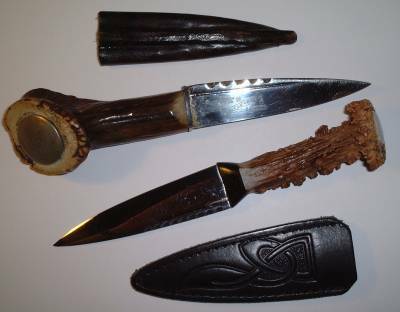 The larger dress sgian dubh (second from the top) is an antique with a wooden hilt that has been carved in a basketweave pattern. The silver-plated mounts have a thistle design and there is an orange colored "cairngorm" stone (probably glass) in the pommel. The sheath is wood wrapped with thin leather. 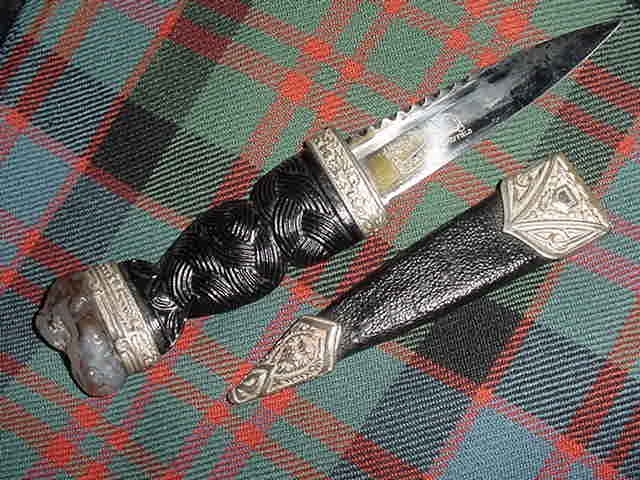 The smaller dress sgian dubh is more modern and is made by Celtic Art, it has a hand-carved ebony hilt, hallmarked sterling-silver fittings, and a dark smokey-quartz gemstone set in the pommel. The sheath is leather over wood and it has a stainless steel blade, unlike the others which are carbon-steel. The last sgian is a vintage knife that has a nicely carved Celtic-knot style hilt made of a lighter colored wood. It has plain silver fittings and a leather covered wooden sheath. At 7" overall length, it is the shortest sgian dubh that I own and it is the sharpest. I dug out my two sgian dubhs. I hadn't thought about them in quite some time. Threw 'em down for some photos. The top one is wenge wood with copper spacers, brass rivets and a brass tang button. The blade is O-1 Sheffield and is quite thick with "gimping" on the spine. The bottom one has a grip of a stag (or some other antler?) with the crown at the pommel end. The end is craved in a with Celtic pattern with an inset peridot and has a brass guard. I don't remember the steel used for the blade, but the spine has filework "gimping" on it. Although I really liked the handle and the balance of it, I was a bit disappointed in the blade, so when the opportunity arose, I traded it for another knife. Sgian dubh's that are also usable knives seem to be hard to find... That's why I'm interested in hearing some opinions about the Nowill blades. Most sgians made these days are primarily ornaments. The blades on the CC sgians are adequate and useable but sgians in general - at least the modern versions - simply are not intended for much use. For one thing, the handles are too small. Your CC sgian had the turned ebony handle, which I think is very nice. A Chinese firm recently copied this sgian, in plastic, so I guess it was popular enough to have been "knocked off" so to speak. Here's mine. High carbon Green River Knife Works blade, handle carved from hickory by me, then dyed. I've been thinking of fileworking the spine, but haven't gotten around to it. Anyone have some good filework pics? This one is definitely a "user". I cut with it all the time. The Knowill blades are decent, since they are Sheffield steel rather than stainless steel they will take an edge. 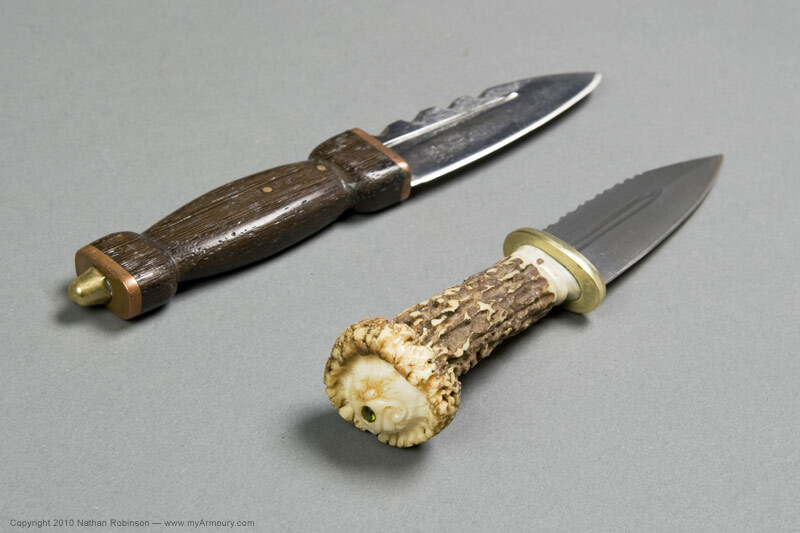 Back in the 1800's and early 1900's there used to be a popular style of hunting knife made by J. Russell and others that was dubbed the "thistle top" because the ebony hilt was turned to somewhat resemble the shape of a thistle (similar to the Comrie Craft sgian dubh in the above post). 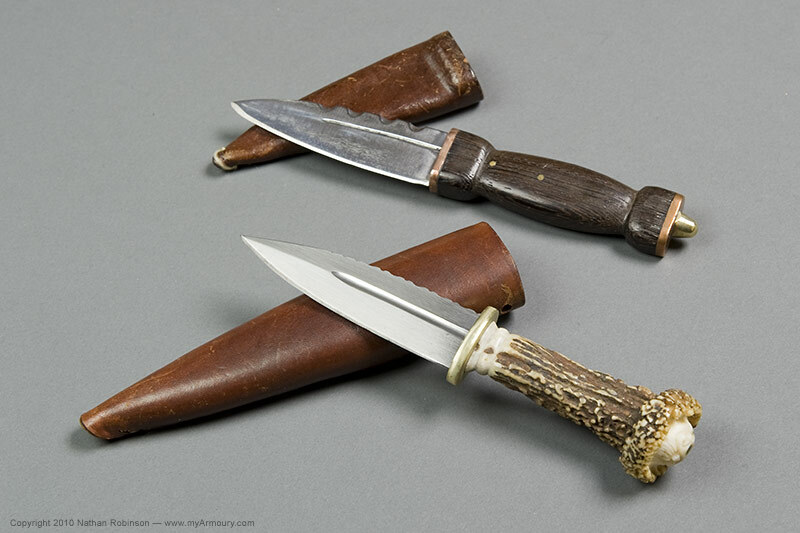 These thistle top knives were THE hunting knife in the late 19th and early 20th century and you can still find them around on places like ebay occassionally. 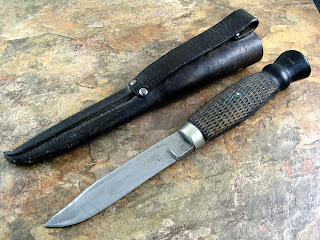 I've always thought that they would make a very nice sgian dubh.